On Thursday, January 18th, 220 Common Ground leaders from Solano and Napa Counties kicked off 2018 with a Neighborhood Safety Assembly at St. Vincent Ferrer Catholic Church in Vallejo. They were joined by 60 allies from across the region. After working for the last 6 years to increase City funding to demolish 800 condemned buildings in Omaha, Omaha Together One Community (OTOC) testified in favor of $1.1 Million included in the proposed 2018 City budget for demolition of condemned structures, up from just $250,000 in 2012 when OTOC started pushing for increases. As a result, the backlog of abandoned houses has been brought down from over 750 to less than 125. Two months after Working Together Jackson put public pressure on Jackson State University (JSU) to replace long-abandoned buildings with green space, leaders celebrated the first demolition on campus. The demolition resulted from a collaboration initiated by Working Together Jackson in which Revitalize Mississippi Inc. agreed to demolish the properties at no cost to the JSU Development Foundation or university. 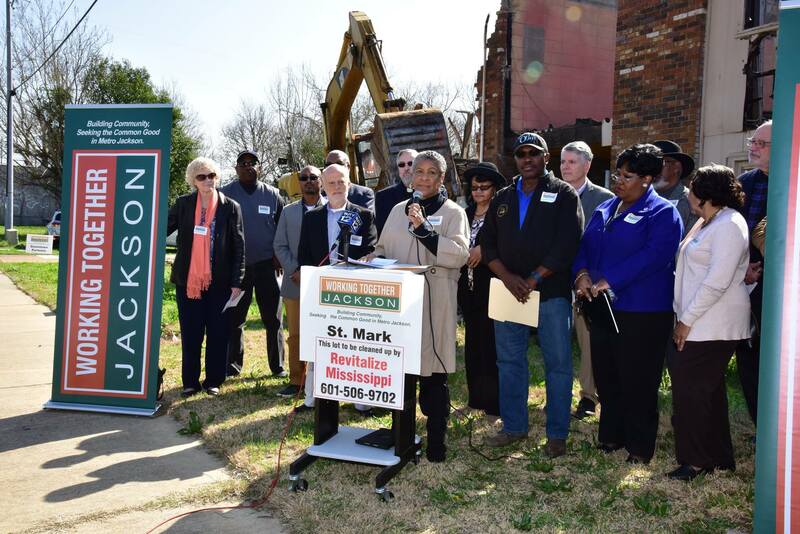 When new dormitory construction stalled for four years, 25 abandoned homes on campus at Jackson State University became host to activity negatively impacting neighbors, including St. Mark's Episcopal Church next door. Leaders began talking to congregants and neighbors and together, with other institutions of Working Together Jackson, are now demanding that in the absence of moving forward with the development, that at minimum the university foundation should pay for the demolition of the abandoned housing and replace it with green space. Said Rev. Luther Ott of St. Marks, " "Those of us who live and work in inner cities know abandoned houses are not abandoned....It's only a matter of time until we're going to a funeral." Omaha Together One Community wants both candidates to commit $1 million a year to the problem. The city has 748 houses on its demolition list. On average, it costs the city about $12,000 to knock down a house -- but neighbors say it's worth every penny. Institutional leaders of Working Together Jackson began evaluating non-profit land trust models to help transform the Mid-City neighborhood of Jackson, Mississippi. Based on conversations with neighbors and residents, Ms. Brent, President of the Mid-City Neighborhood Association, and Rev. Tucker Sr., pastor of True Vine, identified a number of things they would like to address: abandoned housing, overgrown lots, crime, mentoring for its youth and services for its elderly. But people involved in the effort know that, as Rev. Tucker puts it, "the real work of rebuilding the neighborhood isn't cutting lawns or boarding up houses. The real work is building relationships between its residents." While the non-profit land trust would take control of abandoned properties for rehabilitation and renovation, leaders of Working Together Jackson plan to continue the work of building relationships between neighbors. "The City of San Angelo will assist in the repair or replacement of 60 roofs in four neighborhoods targeted for revitalizationâ€¦. The homes, which have been identified with the help of West Texas Organizing Strategy, are in the Blackshear, Fort Concho, Reagan and Rio Vista neighborhoods, all of which the City has targeted for revitalization." "The roar of a bulldozer will prompt a celebration in an Alief neighborhood whose residents have waged a four-year battle to get rid of an abandoned, burned-out condominium complex....The Metropolitan Organization of Houston, along with determined neighbors, thought the disintegrating structure was so dangerous that the city of Houston should spend money to bulldoze the darn thing, but legal and budgetary impediments precluded quick action..... The machinery, which will demolish the public nuisance known as the Winfield I, represents a triumph..."
After 3 years of raising the issue, leaders of Omaha Together One Community (OTOC) are pleased with the decision of Mayor Suttle and the Omaha City Council to invest a total of $500,000 in new funding to demolish condemned buildings in 2013. Total funding for demolition in 2013 will be $840,000, up from $340,000 in 2012. "Many of the speakers advocating the demolition of rundown homes were representatives of Omaha Together One Community....'The first speaker from OTOC showed a variety of pictures of rundown houses. The number of such condemned houses has grown from 400 to 742 in three years,' said Karen McElroy. 'We understand that this is a tight budget year, but the mayor and City Council need to make the tough decisions to preserve our urban neighborhoods,' she said."